Hello, dear young artists! 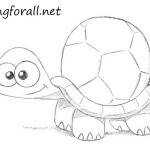 In today’s drawing lesson for beginners we will show you how to draw a cartoon snake. 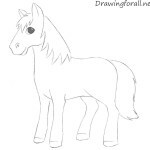 This drawing lesson is pretty simple. 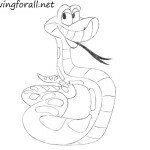 We have divided the tutorial into a several steps to show you the simplest way to draw a snake. At first we draw an oval, as a guide for the head. Using long curved line draw the lower edge of the snake body. Using another long and curved line draw the upper edge of the snake body. Draw the almond-shaped eye and pupil inside the eye. 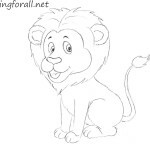 Using a curved line draw the tongue. Draw the forked tongue and move to the next step. And we continue to draw the snake. Erase the guidelines. 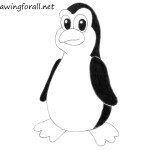 Circle the lines of the drawing to make them clean and smooth. Flatten the lines of the head. Draw the side line using a long curved line. Using short lines draw the pattern on the belly of the snake. It was a drawing lesson about how to draw a cartoon snake. We hope you enjoyed the tutorial. 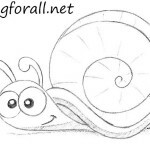 Stay with Drawingforall.net and wait for new drawing lessons. Goodbye!